When the casing is indulgent and crisp in all the right places. When the yolks run. When it is still warm. And when all of these things are achieved at the same time, well, glory be, the scotch egg is a thing of gustatory beauty. The good ole scotchie has been given a bit of a twist here. Don't roll your eyes, I am well aware the original is a thing of splendour. This is just a minor renovation. Whether your brunch game needs lifting or your gutter-born need for something fried after a few too many drinks is high, these are just for you. For yolks with a melted butter-style ooze, five minutes followed by an icy plunge in a bowl of water and ice is perfect. Slight resistance and just cooked through: Six minutes. Don't forget the ice bath. If you want the yolk and white to be the same consistency, go for about six minutes and 20 seconds. Still give it a bath. 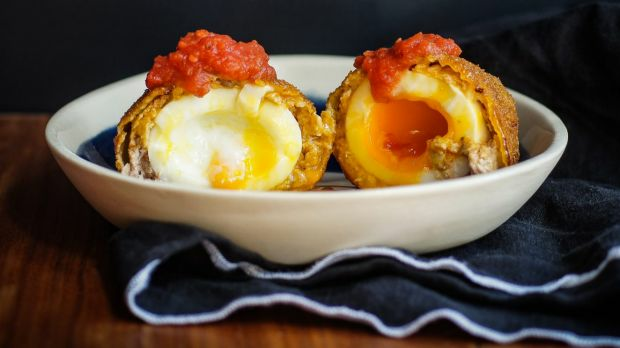 If frying the scotch eggs in a saucepan instead of a deep-fryer, test the oil is hot enough by tearing a small piece of bread and popping it into the oil – it should bubble and crisp on the surface. Alternatively, use a kitchen thermometer to check the temperature (170C). All recipes make six eggs. 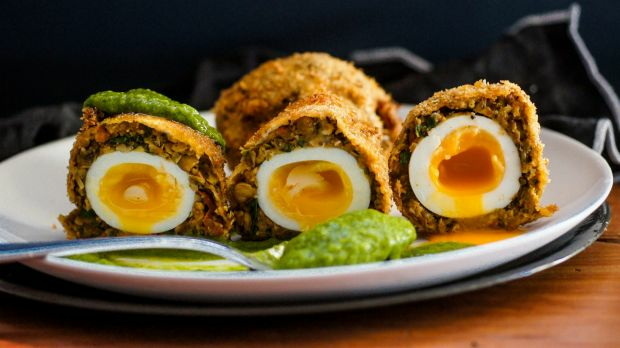 If son-in-law eggs and scotch eggs had a love child, this would be it. This spicy egg belongs on a breakfast table as much as it does with drinks at a bar. Use store bought nuoc cham dipping sauce if you don't have the time or inclination to make it. 1. To make the dressing, place fish sauce, vinegar, sugar and water in a pan over medium heat and stir to combine. Bring mixture to just below boiling point, then set aside to cool. Once cool, add garlic, chilli and lime juice and stir to combine. 2. Add the egg wrap ingredients to a bowl and using your hands, knead the mixture until fully incorporated. Turn mixture out onto a large sheet of baking paper, cover with another piece of baking paper and roll out to 2mm-3mm thick. Place in the fridge until ready to use. 3. Bring a large saucepan of water to a rolling boil. Carefully lower the six eggs in and boil for five minutes (this is for a runny yolk, see par-boiling tips above). While the eggs are cooking, prepare a bowl of ice and water. At the five-minute mark, immediately transfer the eggs to the ice bath. 4. In three smaller bowls, set up your coating station. Add the flour to the first bowl and season generously with salt and pepper. In the second bowl, whisk together the egg and milk with a fork. In the third bowl add the panko crumbs, salt and ginger. 5. Peel the par-boiled eggs. Working one at a time, wrap an egg in the chicken mince mixture to fully encase it, using the baking paper to help you fold the mixture around the surface. Press gently into place. Roll the egg in the flour, dip into the beaten egg mixture then roll in the panko crumbs until completely coated. Repeat with remaining eggs. 6. Heat a deep fryer filled with oil to 170C. Alternatively fill a large saucepan with 10cm-15cm of oil and bring to about 170C. Fry the eggs in batches of two for about five minutes or until golden and crisp. Remove using a slotted spoon and shake slightly to remove excess oil, or drain on paper towel. Serve with the nuoc cham and chopped herbs. This green goddess dressing is a go-to. Good on eggs, steak, chicken, salad – the possibilities are endless. 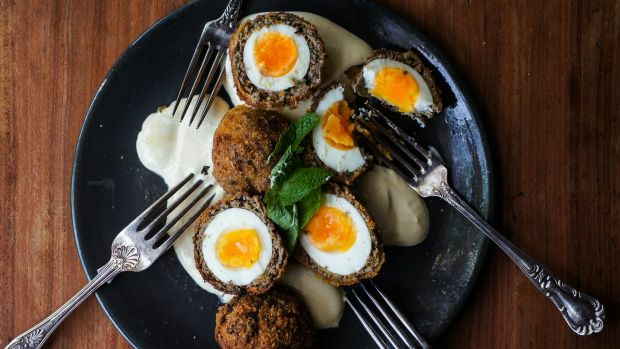 It's nothing short of spectacular with this vegetarian version of a scotch egg. It is also great sans nuts if you need to make it nut-free. Do not over-blend the lentil and chickpea mixture – the difference in texture makes it. 3. Bring a large saucepan of water to a rolling boil. Carefully place six eggs in and boil for five minutes. While they are boiling, prepare a large ice bath. As soon as the time is up, immediately place the eggs in the bath. 4. In three smaller bowls, set up your coating station. In the first bowl, add the flour and season generously with salt and pepper. In the second bowl whisk together the egg and milk with a fork. In the third bowl add the panko crumbs and sumac and stir to combine. 5. Peel the eggs. Working with one at a time, wrap an egg in the lentil mixture, using the baking paper to help you fold the mixture around the surface. Press gently into place. Roll the egg in the flour, dip into the beaten egg mixture then roll in the panko crumbs until completely coated. Repeat with remaining eggs. 6. Heat a deep fryer filled with oil to 170C. Alternatively fill a large saucepan with 10cm-15cm of oil and bring to about 170C. Fry the eggs in batches of two for about five minutes or until golden and crisp. Remove using a slotted spoon and shake slightly to remove excess oil, or drain on paper towel. Plate, drizzle over the green goddess dressing and serve. 2. Place a frypan over medium heat. Add the olive oil, bacon and onion and cook until the bacon is crisp and the onion is translucent. Remove from heat and add to a large mixing bowl. Add the remaining wrap ingredients and using your hands, mixt until fully incorporated. Place the pork mixture on a large sheet of baking paper, cover with another piece of baking paper and roll out to 2mm-3mm thickness. Move the flattened mix onto a tray and place in the fridge until ready to use. 3. Bring a large saucepan of water to the boil. Gently add the eggs and boil for five minutes. While the eggs are cooking, prepare a bowl of ice and water. At the five-minute mark, immediately transfer the eggs to the ice bath. 4. In three smaller bowls, set up your coating station. Add the flour to the first bowl and season generously with salt and pepper. In the second bowl, whisk together the egg and milk. In the third bowl add the panko crumbs, ground coriander and ground celery and stir briefly. 5. Peel the par-boiled eggs. Working with one egg at a time, wrap an egg with some of the pork mixture to fully encase it, using the baking paper to help you fold the mixture around the surface. Press gently into place. Roll the egg in the flour, dip into the beaten egg mixture then roll in the panko crumbs until completely coated. Repeat with remaining eggs. 6. Heat a deep fryer filled with oil to 170C. Alternatively fill a large saucepan with 10cm-15cm of oil and bring to about 170C. Fry the eggs in batches of two for about five minutes or until golden and crisp. Remove using a slotted spoon and shake slightly to remove excess oil, or drain on paper towel. Serve with tomato relish. 1. Mix together the yoghurt, ginger and turmeric in a small bowl and pop in the fridge until ready to serve. 2. For the egg wrap, add the mustard, fenugreek and coriander seeds to a frypan and place over medium heat. Stir constantly until fragrant and toasted. Roughly crush the spices using a mortar and pestle. Add the crushed spices to a bowl with the mince, curry powder, coriander and garlic and using your hands, mix until fully incorporated. Transfer the mixture to a large sheet of baking paper, cover with another piece of baking paper and roll out to 2mm-3mm thick. Place in the fridge until ready to use. 3. Bring a large saucepan of water to a rolling boil. Carefully lower six eggs in and boil for five minutes . While they are boiling, prepare a large ice bath. As soon as the time is up, immediately place the eggs in the icy water. 4. Peel the par-boiled eggs. Working with one egg at a time, wrap in the beef mince mixture to fully encase the egg, using the baking paper to help you fold the mixture around the surface. Press gently into place. Roll the egg in the flour, dip into the egg mixture then roll in the panko crumbs mixture until completely coated. Repeat with remaining eggs. 5. Heat a deep fryer filled with oil to 170C. Alternatively fill a large saucepan with 10cm-15cm of oil and bring to about 170C. Fry the eggs in batches of two for about five minutes or until golden and crisp. Remove using a slotted spoon and shake slightly to remove excess oil, or drain on paper towel. 6. Drizzle the yoghurt across a serving plate. 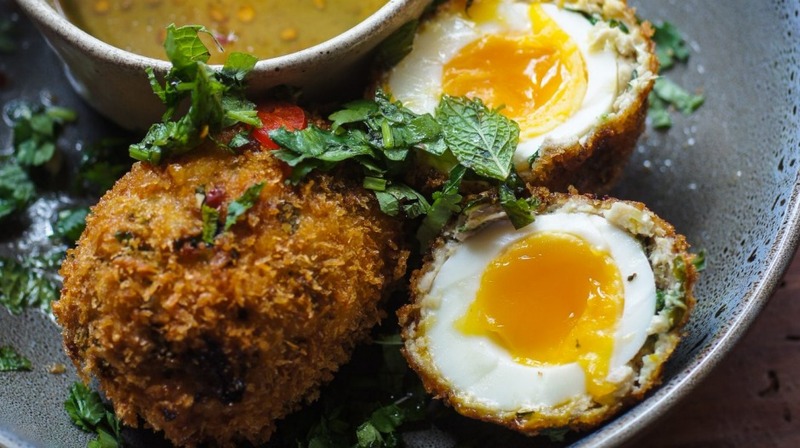 Arrange the scotch eggs, scatter with chopped herbs and serve piping hot.